One of Alvarez’s best selling guitars. The AG75CE is a great all round instrument for live work or recording. 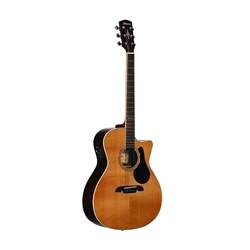 The cedar/rosewood woods create a sophisticated look and the GA body shape is perfect. Our Grand Auditorium has the same scale length as our dreadnoughts but a slightly smaller body with a narrower waist that accentuates the trebles.